Still looking for an audio card recommendation. I have four MOTU Mk3 Ultralight Hybrid. They work great for stereo but I can't seem to get 7.1. WatchOUT only sees stereo pairs and can only use 1 set at a time. Windows and WatchOUT used to see the MOTU as a digital output with 8 channels but not anymore. I have four Echo Fire 8. I'm sure those would still work but they're FireWire only and I don't have FireWire anymore. Never would have bought them except they were one of the only 8 channel cards that worked with WatchOUT at the time. I need 7.1 (8 channel) capacity and preferably no Thunderbolt or FireWire. 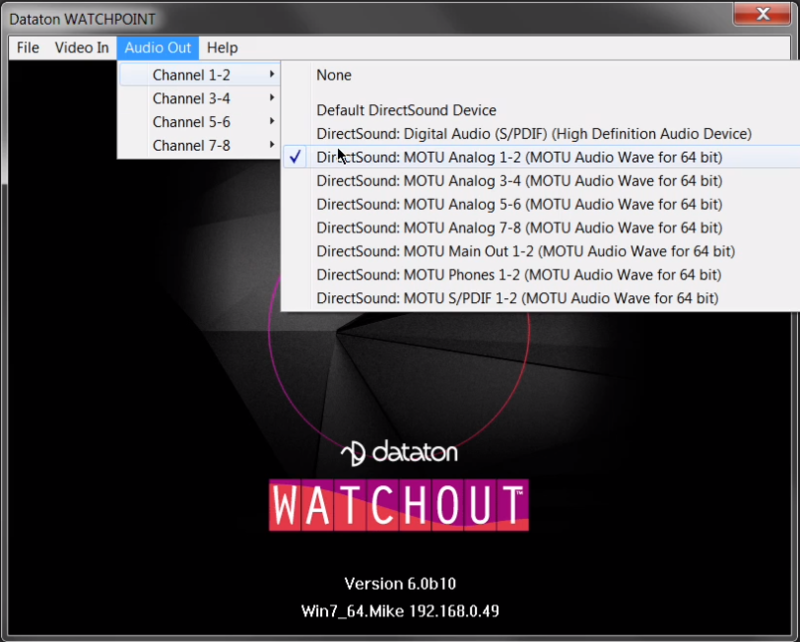 Are there recommended audio cards for WatchOUT? What WATCHOUT version? Stereo pairs in v6 should provide access to all channels. I've watched the video on how to setup the new audio system with 8 channels and it very much makes sense. But my WatchOUT Display machine doesn't have options for channel 3-4 5-6 and 7-8. I can only assign a "device" and nothing beyond that. 6.2.x+ no longer utilizes WDM, it now requires an ASIO driver for up to 24 channels of output. I am pretty sure all MOTU interfaces offer ASIO drivers, so it may be as simple as updating your audio driver. This is a brand new card driver install. Of course MOTU hasn't updated the drivers for this card since Oct 28 2015. I'm using MOTU Mk3 Ultralight Hybrid. The picture with 6.2.2 is me. Everything is (MOTU Wave for 64bit) [WASAPI]. I can assign audio to only 1 channel pair at a time. I have an ASIO option for the setup (MOTU Audio ASIO (ASIO) last on the list but selecting that results in no audio at all. The picture with 6.0b10 is from Dataton's video. That's the one with all the DirectSound but it has options that make sense. The unit they are using uses the same drivers as the unit I am using. Maybe this video from Dataton is no longer valid? These older MK3 Hybrids basically died a long time ago for WatchOUT use. I was forced to replace them with AudioFire8 cards. I was hoping with the new routing capacity that they'd be back as serviceable... If that's not the situation then I don't mind buying new cards as long as I know they're going to work. I really don't want to install a FireWire card in the server and go back to the Echo AudioFire8. I have not been impressed with the quality of that card. I'd rather buy new audio cards than go that route. The picture with 6.2.2 is me. Everything is (MOTU Wave for 64bit) [WASAPI]. I can assign audio to only 1 channel pair at a time. That is correct, WASAPI is only going to allow 2 channel output. IS there not an ASIO driver available from MOTU. I have an ASIO option for the setup (MOTU Audio ASIO (ASIO) last on the list but selecting that results in no audio at all. There is an ASIO option but it doesn't work. WatchOUT sees it as 14 channels (I'm guessing 6 in, 8 out) but when I select ASIO from the drop down menu I get no audio at all and no way to assign any channels after that. Edit: the card actually has 14 outputs total. I use the card with Reason for multi in/out recording and monitoring. Do you know the name/brand of a card that works? I'm tired of chaising tails and shooting in the dark HOPING it's going to work. Does anyone know of a card that works with 6.2.2 and Windows 10 and isn't FireWire/Thunderbolt? I installed ASIO4ALL on one machine. Now when I run Production I can get 8 channel audio by selecting MOTU ASIO. If I select Asio4All I get nothing but installing it did something and now the MOTU Asio works. But only in Production. I still get no audio with Display even after matching the settings used in Production. This is starting to make no sense at all. You have the correct driver installed already. It's the one at the end of your list: Motu Audio ASIO. You will not see this in the audio settings of Windows since Windows does not see ASIO at all. But you will see it in WATCHOUT once selected. If you are still looking for suggested USB audio boxes, look at the Behringer UMC1820 or the Focusrite Scarlett 18i20. It's very confusing. But it's enough to get me through show. ASIO didn't work at all on my personal server until I installed ASIO4ALL which makes even less sense since I'm using MOTU's asio and not a4a. The 4k server at the shop setup just fine on both Display and Production so there's something goofy in my personal server. I'll check back if/when I find a solution. 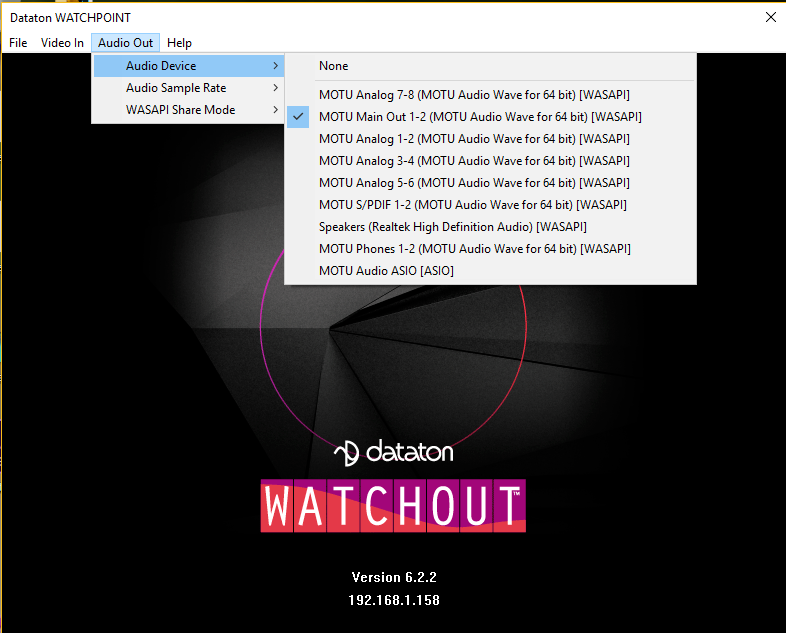 I have used the MOTU MK3 ultralight with ASIO on my Display computers using USB and didn't have issues getting 8 channels of audio out of it with Watchout 6.2. I do not have ASIO4all installed on any of my machines.